Discussion in 'iMac' started by Jay9495, Nov 30, 2012. Hey guys, I ordered a BTO 27" with an i7, GTX 680, it ended up costing me $2439, i was going to get the fusion drive, but I couldn't justify paying an extra $275 just for fusion,I will be gaming, and doing some video editing via premiere, after affects and Final Cut Pro, do you think it would make much if a difference if I were to get it, or I wouldn't see much difference ? There would definitely be a difference in speed but with what you do with your computer, it may not bother you all that much. Your rendering times in Final Cut Pro will benefit the most from the i7 but not so much from having a fusion drive. You stuck within your budget so that's a good thing. You should be very happy with your purchase. I wouldn't worry. At the moment SSD's and fusion are a developing tech, and one that costs big bucks. While Fusion might be the next big thing, we'll know much more in 2-3 years when most computers have some kind of SSD. You can always add a Thunderbolt SSD when a well priced one is available, but you can't get back the premium you paid for Fusion. I don't see Fusion being future proof at all either. While it does look fantastic, there are clearly some bottlenecks and limitations that mean the SSD part is redundant. Most of these limitations seem to be in the software, but of course next time they might write software with fusion in mind. Now that is something worth paying a premium for. Fusion is too much of an unknown. Most importantly though, you didn't spend more than you have. Too many people trick themselves into believing that they "need" the top line model, and spend much more than they have, and for what?!? SATA drives are fine, and by the time the next big update comes around, you'll know what to buy and they will probably be in your price range. Have you used a ssd before? They make a Massive difference!!! I put one in a older macbook (2006) and it's like night and day a whole new computer. I would reorder,it's money well spent! This is actually a really good question, but for another reason. If you haven't used an SSD then you'll be fine. Makes a big difference to loading anything stored on the SSD drive but if you're used to regular hard drive performance you won't find anything lacking on the 27" iMac. Let's be fair, SSD's are fast and we know that, but he is asking about Fusion and would he regret not having it. I'd wager the answer is no, and he doesn't have the cash either. OP you might want to read the Cnet mac mini review which picks out some pros and cons of the fusion. Really? Are you sure of that? I would have though he would prefer an honest answer. My advice would also be to reorder with Fusion. My advice would be to order an external thunderbolt SSD such as a seagate goflex adapter perhaps. That's cool, but the dude is talking about financial restrictions, my advice is to not pay more money than you have. If the OP wants to save up for Fusion, fine but it appears he hadn't got the expendable, & it's hardly like a non-fusion iMac has become a dog overnight. Frequently in the reviews I've seen, it's being described as a nice to have not a must have which is worth considering at this stage. Never spend more than is in the bank. Here's the cnet review I mentioned before, whose mileage varied in terms of speeds they got out of the Fusion drive depending on their usage. Once you surpass that 128GB, the benefits of Fusion vary depending on what you're doing. It's only when you want to write more than 4GB at a time that you'll notice a slowdown. This seems to be key if Jay9495 wants to return to his original order to rethink. That will depend on his useage. Also read speed stuff too. But still... the money thing. That overrules everything else. I agree that SSD is the biggest boost you can get from upgrading, you can't go back once you've taste the speed difference. But I think the price Apple is asking for fusion drive is too much. If I were to buy iMac, I'd get fusion drive first over i7 & 680mx though. Your rendering times in Final Cut Pro will benefit the most from the i7 but not so much from having a fusion drive. Everything and I mean EVERYTHING when editing involves the speed of a hard drive as you are reading and writing data. When you are using your cpu to render that file where do you think it's writing too? Hard drive, Cpu, Gpu and Ram... Heck honestly it's all important, but man you need a fast hard drive. I mean of course you can get by with the stock but a faster hard drive is King. You should be apologizing to me. Remember, the i7 has Hyperthreading and the i5 does not. That will make a difference in rendering times with or without the fusion drive. Sure, the OP would benefit from a fusion drive (who wouldn't) but he was trying to keep costs down. Must be nice to know how to spend other people's money. For less than $250, you can buy a larger SSD than comes with the the Fusion option and add it yourself, setting up Fusion drive on your own if you want to. I assume this is possible with an iMac, I did it in my Macbook Pro and have been really happy with the results so far. My only question is of there is physical space inside to do it - but if it's a BTO option, there must be a way to get both drives in... may just have to wait for 3rd party mounting brackets to be produced if they are needed. Can i upgrade an SSD by mself? Or does the 27" only have one HDD slot? MAybe an msata slot? Apple likes to use "blade style" SSDs instead of the conventional (but space-wasting) SSDs built inside a disk-sized box. Early pictures from the insides of the 21.5" iMac reveal space for one of these blade style SSDs. But not every 21.5" iMac has the connector loaded. Mixed in with the Japanese words, I see "iMac 21.5" and "2.9 GHz", which suggest to me that the pictures came from the US $1499 model. So it seems to depend on which model of 21.5" iMac you get. The hard drive in a 21.5" system is a standard form-factor 2.5" drive. There will likely be ways to replace that with a 2.5" SSD. The 27" iMac is expected to be similar, except the drive is most likely a 3.5" one. There's not likely a second conventional hard drive "slot" in either iMac, since Apple doesn't offer any 2-drive options. Honestly I don't think I will see much of a difference because the iMac I am getting will still be so fast comparing to what I have now, and I certainly do not want to wait any longer than 2-3 weeks to get the iMac, if I do choose the fusion drive the order would be delayed. Enjoy your machine, and kudos for living within your budget. But where can i afford a BlaseStyle SSD? 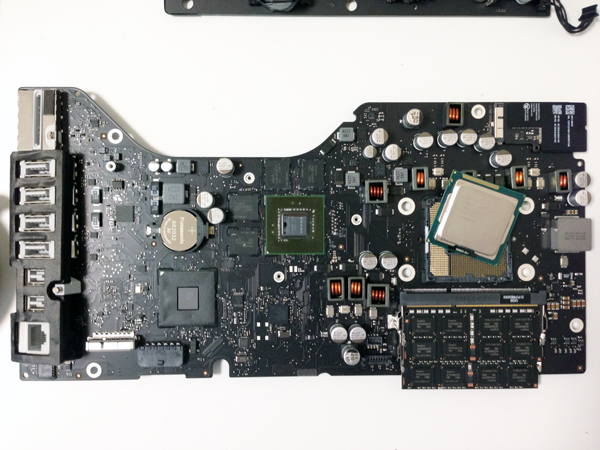 The connector on the japanese Imac reminds me on a msata connector in my Alienware m14x... so does a msata ssd fit in there? If I was going to upgrade the SSD, I would probably order a HDD only version and upgrade the HDD with a 2.5" SSD since it does not appear too difficult to get to the HDD bay. The only ones I know of are from Other World Computing. There are probably others. OWC doesn't (yet) offer any SSD upgrades for the 2012 iMacs. Do you work in Final Cut pro? Make sure you know what you're talking about before you "assume" what you have no idea on. Hard drive is the MOST important thing for your newest system. An ssd drive with an i5 will smoke an i7 with a stock hard drive.